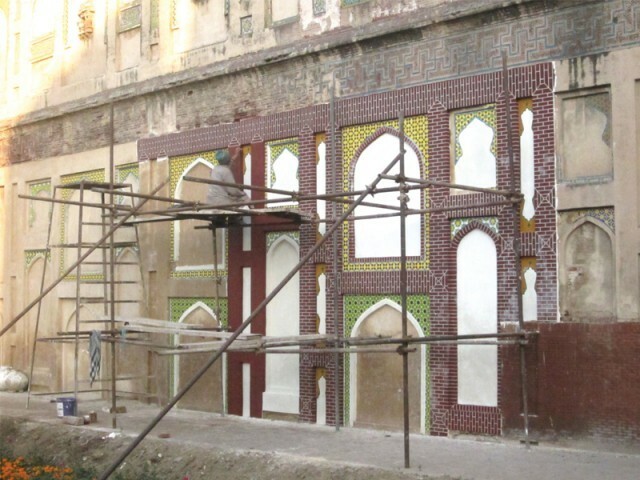 The department undertook conservation and restoration work on the Picture Wall, Diwane Aam (hall of public audience), Diwane Khaas (hall of special audience), Lal Burj and Kala Burj (red and black towers) and Jehangir’s Quadrangle in 2011. Afzal Khan, the deputy director of the Archaeology Department, told The Express Tribunethat the heavy moisture in the air prevented certain materials used in the flooring and in consolidating parts of the old buildings from setting and drying properly. The picture wall, which is about 1,500 feet long and 55 feet high, is adorned with murals of Mughal court life and battles. Khan said a small patch of the picture wall is being restored on an experimental basis. It will be replicated on the rest of the wall once the weather changes. The picture wall shields the north-west part of the Fort. The eastern side of the wall was constructed by Mughal emperor Jehangir and the western half by Shah Jehan. It was completed in 1631 AD. The restoration of Diwane Aam is about 80 per cent complete, including work on the red sandstone building, marble fencing and repairs to the ceiling of its veranda. The floor of Diwane Aam is being rebuilt but has been put on hold until February. Work will also begin again in February on repairing the floors of the basements of the Lal Burj and Kala Burj. The floors, 300 feet by 200 feet, have not been repaired since the 1930s. The basements are about five feet high. The semi-octagonal structures were built during the Sikh period to allow views of the countryside from the northern part of the Fort. Work on the floor of Jehangir’s Quadrangle, which was recently opened to the public after almost eight years of restoration work, is also set to restart in February. The Punjab government approved Rs300 million for the restoration work at the Lahore Fort in the 2012-13 budget. An Archaeology Department official said that Rs10 million of this had been released so far. He said that the funds were expected to be released in August, but had not been released till September. He expected another Rs10 million to be released after this month. He said that the delay in release of funding also held up the conservation work.